Kacy Catanzaro Dating Hunky New Boyfriend, Husband Found At Last? Home » Relationship » Kacy Catanzaro Dating Hunky New Boyfriend, Husband Found At Last? American professional wrestler Kacy Catanzaro broke up with her stunt performer boyfriend to begin a married-like relationship with a new hunky boyfriend. The native of Glen Ridge, New Jersey is recognized as the first woman ever to qualify for the finals of NBC’s sports competition, American Ninja Warrior in 2013 and to complete the show’s City Finals course. She is signed to WWE and was spotted at a tryout session at the WWE Performance Center at Orlando, Florida in 2017. Recently, she made her debut on the WWE Network for the women’s wrestling tournament, Mae Young Classic in September 2018. Kacy competed in gymnastics in Division I of the National Collegiate Athletic Association for Towson and was named as the Southeast Regional Gymnast of the Year in 2012. The WWE talent was born as Kacy Esther Catanzaro on 14th January 1990 to parents, Andrew Catanzaro and Kathryn Catanzaro. She is accompanied by two sisters, Cheryl Catanzaro, and Jessica Catanzaro. Standing at the height of 5 feet (1.52 meters), she weighs only 95 pounds (43 kg). At the age of 22, she recieved graduation from the Towson University in 2012, where she studied early education on an athletic scholarship. Since an early age, she started training for gymnastics with the passion for being an athlete. Because of athletics, she even earned scholarships for both her school and college education. In 2013, she started working for an obstacle-course gym Alpha Warrior, where she is now a managing partner. On the same year, she got participated on American Ninja Warrior, but she failed to qualify despite entering as a wild card entry. A year later, she became the first women to finish the qualifying round of the show successfully. Her last appearance on American Ninja Warrior was on its ninth season in 2017. Kacy has also been associated with WWE, signing in 2017. She now competes in the various wrestling tournaments of NXT, one of WWE's developmental brands. 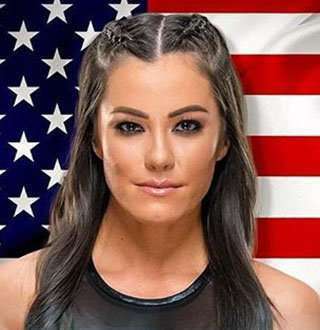 How Much Is Kacy Catanzaro's Net Worth? When it comes to earning, Kacy has garnered a considerable amount of net worth from her stint to athletics. Appearing on the various competitive shows, she has recieved the grand paychecks. Apart from the shows, she has also earned remarkable income appearing on various commercials. She was featured on the advertisement of Fairfield Inns, the economy chain of hotels that are franchised by Marriott International. As of now, Kacy relishes the extravagant lifestyles along with the net worth of $ 500k. Diving towards her dating affairs, she was in a relationship with Brent Steffensen, aged 38. The couple started dating in February 2013 and even spent two years training with her stunt performer boyfriend, Brent for American Ninja Warrior. After dating for more than three years, they got separated in June 2016. Then she began her relationship with hunky boyfriend, Dave Reid III. Kacy, aged 28, has been dating Dave, an army ranger, who also serves as the director of the Robert Irvine Foundation, for more than a year according to their first picture together on Facebook in May 2017. With that, their married-like relationship got a significant place on their respective social sites. In October 2017, she shared a Twitter picture with her boyfriend with a lovely caption quoting "Love is friendship that has caught fire". Later, she shared her love thanking him for being the freaking best. Their intimate relationship manifests that they might take a step ahead in their relationship and get married giving each other a husband and wife tag. Brooke Hogan Nearly Married Turning Boyfriend Into Husband; Why Didn't She? Fox News Greg Gutfeld's Wife & Married Moments Will Kick Gay Rumors Away; It's That Strong!